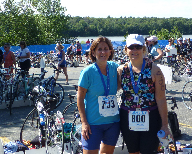 Congratulations to Fitting Fitness In™ clients Cathy and Barbara for completing their first triathlon! Awesome job ladies! With a little training and a lot of excitement, Cathy and Barbara raced with almost 600 women in the Title 9 Women’s Triathlon in Hopkinton, MA on September 11, 2011. The Title 9 Triathlon is a sprint length triathlon, consisting of a 1/4 mile swim, a 10 mile bike, and a 3.1 mile run. 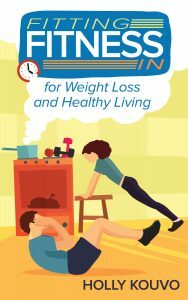 Starting in July, Cathy and Barbara met several times with Fitting Fitness In™ trainer, Lorae, a USA Triathlon Certified Coach, to get ready for the race. Each time they met they would discuss a different aspect of the triathlon and do a workout that focused on a specific portion of the race. Lorae provided them with an eight week training plan that outlined what they needed to do each day so that they could train properly on their own outside of their sessions together. During their sessions with Lorae, they learned what to expect during the race. They discussed such things as nutrition and hydration for racing, beginner tips, and how to master transitions (the time period in a triathlon between the swim, bike, and run portions of the race). Their last session consisted of a trip down to Hopkinton State Park to ride the race course and then jump in for a short swim. “At 54 years young, it was so satisfying to try something new! Because the Title 9 triathlon was held in Sept, I spent most of my training time outdoors during the summer – bicycling, swimming and running. It was a great way to enjoy the beauty of summer and get my training in, too. The Title 9 event was very well organized, with lots of support for “newbies” like us. The atmosphere on race day was positively electric! There are many levels of triathlons, and with the proper training and knowledge, competing in a triathlon is an achievable goal for people of all ages and fitness levels!